Mayor Tsunoda re-elected in Aliso Viejo. Several Asian Pacific American candidates ran in local elections in Los Angeles and Orange counties on Nov. 4. Following are some of the results. • In the District 2 race for the Orange County Board of Supervisors, Michelle Steel, vice chair of the California Board of Equalization, won by a wide margin over Assemblymember Allan Mansoor, 76,199 (62.4 percent) to 45,923 (37.6 percent). 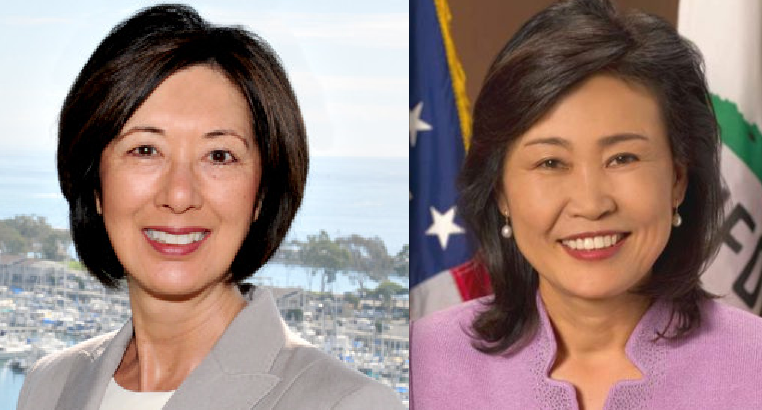 Steel is the nation’s highest-ranking Korean American office-holder and California’s highest-ranking Republican woman. • In Aliso Viejo, Mayor Phil Tsunoda was re-elected to the City Council with 3,206 votes (25.3 percent), finishing second out of five candidates. The top finisher was retired sheriff’s sergeant David Harrington with 3,904 (30.8 percent). Also running were City Councilmember Carmen Cave, retired teacher Gary Miller and small business owner Andrew Arbrecht. • In Fountain Valley, Mayor Michael Vo was re-elected to the City Council with 6,450 votes (17.2 percent), finishing third out of nine candidates. City Councilmembers Mark McCurdy and John Collins were first and second with 6,546 (17.5 percent) and 6,467 (17.2 percent), respectively. The other candidates included chiropractor/restaurant owner Jonathan Bao Huynh, scientist/entrepreneur Tuan Nguyen, and businessman Tom Nguyen, who finished seven, eighth and ninth, respectively. • In Garden Grove, Mayor Bruce Allan Broadwater was re-elected with 11,622 votes (42.4 percent). Bao Nguyen, a trustee of the Garden Grove Unified School District Board of Education, was second with 11,596 (42.3 percent). Retired police commander Albert Ayala was third with 4,184 (15.3 percent). 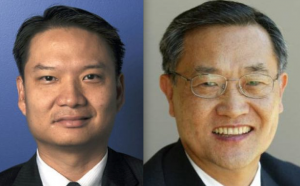 • Phat Bui, CEO of a technology and management consulting corporation, was elected to the Garden Grove City Council with 11,670 votes (23.6 percent) along with incumbent Kris Bear, who received 11,172 (22.6 percent). The other nine candidates included businessman Quang “Mike” Tran (fourth place), construction consultant Joe Do Vinh (fifth place) and accountant Ruhina Khan (ninth place). • In Irvine, Mayor Steven Choi was re-elected with 18,121 votes (45.4 percent). Irvine Planning Commissioner Mary Ann Gaido was second with 17,175 (43.0 percent) and small business owner Katherine Daigle third with 4,633 (11.6 percent). • In Laguna Woods, retired business executive Rae C. Tso was elected to the City Council with 2,852 votes (21.9 percent). Mayor Bert Hack was in first place with 3,299 (25.3 percent). There were four other candidates. • In La Palma, City Councilmember Steve Hwangbo was returned to office with 2,402 votes (42.5 percent). Realtor Michele Steggel was also elected with 1,662 (29.4 percent). Retired businesswoman Christine Barnes was out of the running with 1,585 (28.1 percent). • In Villa Park, entrepreneur/consultant Sanjay “Jay” Khetani finished fifth out of six candidates with 696 votes (11.6 percent). The winners were businessman Bill Nelson, project manager Robert Collacott and Mayor Pro Tem Diana Fascenelli. • In Westminster, Mayor Tri Ta was re-elected with 13,471 votes (85.1 percent). Challenger Andy Truc Nguyen, a freelance journalist, received, 2,360 (14.9 percent). • Businessman Tyler Diep was elected to the Westminster City Council along with Mayor Pro Tem Margie Rice with 9,941 votes (34.4 percent) and 8,659 (29.9 percent) respectively. Engineer/business owner Chi Charlie “Manh” Nguyen was third with 6,500 (22.5 percent) and businessman Alin “Al” Hamade was fourth with 3,816 (13.2 percent). • In Yorba Linda, prosecutor Peggy Huang was elected to the City Council with 7,884 votes (24.3 percent) along with incumbent Tom Lindsey, who received 7,723 (23.8 percent). There were four other candidates. • In Alhambra, two-term City Councilmember Stephen Sham was re-elected with 4,689 votes (51.78 percent). His challenger, aerospace engineer and former Planning Commissioner Eric Sunada, fell short with 4,367 (48.22 percent). • In the District 6 race for San Diego City Council, nonprofit executive/businessman Chris Cate won with 17,029 votes (53.31 percent), beating educator Carol Kim, who received 14, 913 (46.69 percent). • In San Luis Obispo County, Tommy Gong, currently assistant clerk-recorder, was elected county clerk-recorder with 33,721 votes (62.55 percent). Deputy Clerk-Recorder Amanda King received 20,094 (37.27 percent).